A two-storey extension used to be quite rare but in the last decade or so, when the extension has become a way of making money as much as improving quality of life, they have become a lot more popular. The reason is that although a two-storey extension will cost a lot more than a single storey one, it’s much better value for money overall. If you’re building an extension with a proper (i.e. 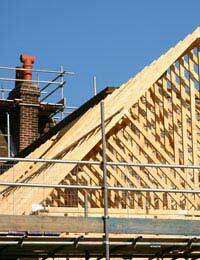 apex) roof, then the cost per square metre will be higher for one storey than a two-storey extension. This is mainly because the roof is a disproportionally high cost of the build. Also the builders and other trades are on site anyway so a lot of preparation costs and tidying up costs are proportionally smaller. You can also get bigger discounts on materials, as you are buying larger amounts, and transportation costs to the property are proportionally lower too. Of course if you compare it with a flat roofed single storey extension then the math doesn’t add up, because a flat roof is cheaper than a proper roof. But then someone who is doing an extension with the idea of making money on the resale value would be unlikely to specify a flat roof anyway. But look at the value you are adding to the house as well. The downstairs section can make room for a further reception room or a modern open plan kitchen and family room, both of which make the property more appealing to a wider selection of buyers. The upstairs portion would add a bedroom, possibly a large master with en-suite. With the odd way that property values work in the UK, adding another bedroom usually takes a house up into a new price bracket. And the en-suite just makes it more attractive still. So you are adding value on both levels, a double whammy. One of the significant factors with extensions that affects family life is the disruption of the actual building work. Granted, a two-storey extension will take longer to build than a single story extension, but not twice as long. It’s better to get the disruption all over in one go rather than having a second bout later on. The downside is that you’ll have disruption on both levels of the house, it’s not as though you can go upstairs to escape it. For this reason many people having two-storey extensions sometimes move out of the house temporarily while the bulk of the work is done. This again affects the economics of the project as a whole, unless you have nearby relatives who are prepared to put you up for a couple of months. Although the odds are in favour of a two-storey extension as being a better long-term investment than a single-storey one, you need to make sure of this before you go ahead. Remember to get quotes for both options. Add in the incidental costs, having to live out for a period of time, for example, and the extra decorating costs, extra bathroom suites, not forgetting the extra furniture you’ll need. Then talk to local estate agents to estimate the value you can expect to add to the property. Remember that there are ceiling prices for each road or estate, which means that no matter how fantastic your house is, no-one will pay more than a certain amount simply because of the location. If you do decide to go for it, remember that quality sells, so don’t cut corners.